Season’s greetings, Merry Christmas, and Happy Holidays everyone! 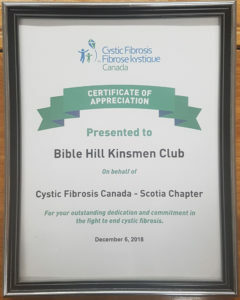 The Kinsmen Club of Bible Hill is as busy as ever, with a lot of projects underway and more in the works for 2019. The Truro Bearcats partnered with our club for the 6th annual Teddy Bear Toss on December 2nd. The Bearcats scored early in the game against the Miramichi Timberwolves, and 319 stuffed animals were tossed on the ice! That’s a record, and means nearly 1,500 have been collected at the event over the last six years. Once again, the stuffed animals will be distributed through the local Christmas Index Program. 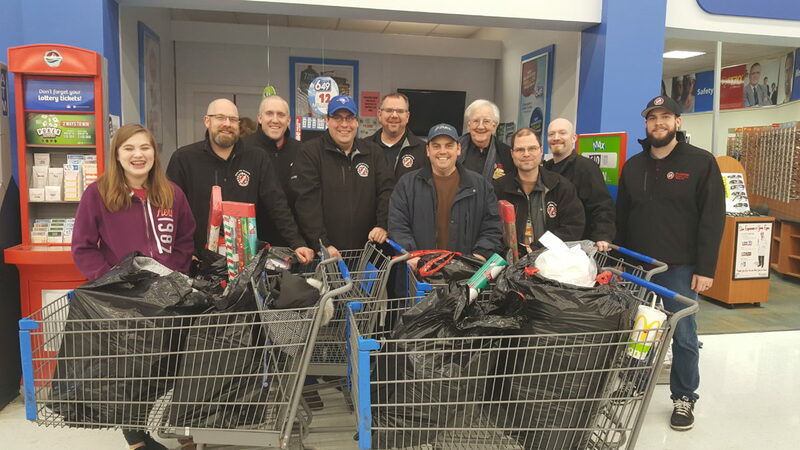 Speaking of the Christmas Index Program, our members were at Wal-Mart this week to do some shopping. We’ve been lucky enough through your continued support to be able to expand the number of families we help each year. As Christmas gets a little bit closer, we’ll deliver the gifts to the selected families, and ensure they have groceries as well. It’s a project our club looks forward to the most each year. Not only is it a perfect way to give back to the community around the holiday season, but it’s also a great night of fellowship. 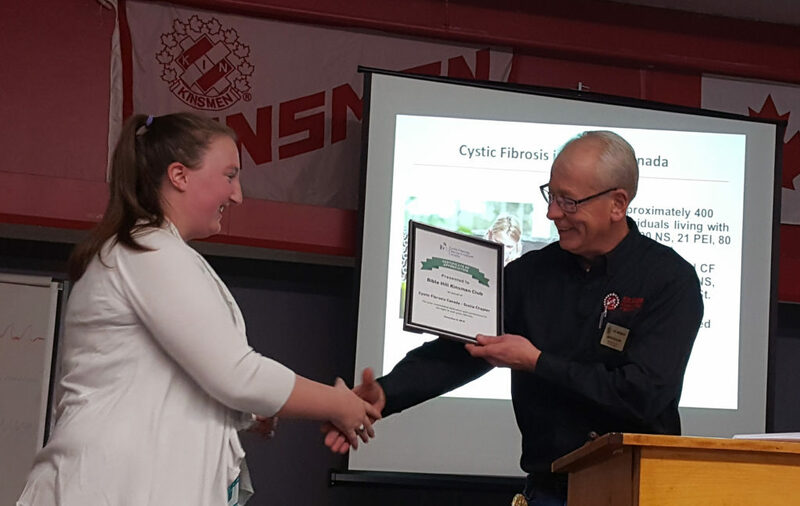 Brittany Smith, Community Engagement Coordinator for the Atlantic Region with Cystic Fibrosis Canada, and Bible Hill Kinsmen President John Spears. Another way our club supports Cystic Fibrosis Canada is through the Ultimate NHL Road. This is an annual fundraiser, and the grand prize will send you and a guest to three NHL games in three nights: Pittsburgh at Montreal on March 15th, Dallas at Ottawa on March 16th, and Montreal at Toronto on March 17th. Tickets are just $10, are only sold in Atlantic Canada, and just 9,000 have been printed! Contact us on Facebook or by email at info@biblehillkinsmen.ca for tickets, or contact one of our members. If you’ve been around Downtown Truro, you’ve probably noticed we still have two KINdness Meters up and running at the Farmer’s Market and by the Marigold Cultural Centre. These parking meters will gladly gobble up your loose change! Money raised is used in a variety of our initiatives throughout the course of the year. We’re also preparing for our annual New Year’s Eve Dance at Bible Hill Junior High School. DJ Harv will be the entertainment, with a 9 p.m. start time. There’s also a cash bar, and attendees must be 19+. Tickets are $25 each and are available from any of our club’s members or by emailing newyearsdance@biblehillkinsmen.ca. They’re also available at MacQuarries Pharmasave on the Esplanade. Finally, there are a few rumblings about our annual Trivia Night. Expect news on this early in the New Year, but it’s never too late to start putting your team of eight together so you can grab a table as soon as they’re available! For details, email trivia@biblehillkinsmen.ca. Next Next post: The Great Trivia Challenge Returns!